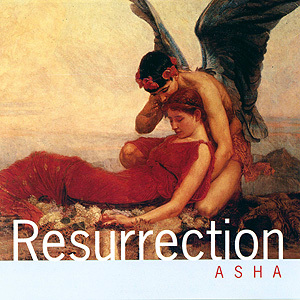 Asher's first album co-produced with James Asher, himself a new age composer and percussionist. There are two long tracks, the mantra-like 'Maranatha', and the filmic, improvised, orchestral narrative 'Promised land'. There is also a version of 'Amazing grace'... the only truly vocal track on the album... and some instrumental vignettes describing the birth of Asher's first son, Theo, as well as Asher's own childhood. There is an eclectic mix of styles on Resurrection, with 'Promised land' arguably the stand-out track.